Available in Brown, Black, Green, Grey, Blue, Red! Q : How does the boot liner attach to my car? A : The boot liner attaches using a combination of velcro for the side panels and buckles around your car's rear seat headrests. Q : Which areas of the boot are covered by a boot liner? A : Our bootliner covers back of back seat, boot sides and boot floor. If an optional bumper flap is ordered, this attaches to the liner and will protect your bumper. Q : Can I use my seats in the down position without having to remove the boot liner? A : Yes, all our bootliners allow for your rear seats to be folded flat. This provides additional protection as what was the back of back seat cover then becomes an extended floor mat. Q : My car has a down tailgate – will your boot liner cover this? A : The bootliner will not cover the down tailgate but select the Bumper Flap option when ordering and we will automatically send a down tailgate cover instead. Q : Can I use your boot liner with a dog guard? A : In most cases, yes. The only exceptions are where the dog guard is bolted to the floor or other areas normally covered by the boot liner. Q : How do you clean your seat covers and boot liners? A : To care for your boot liner or seat covers, simply wipe clean, hose down or machine wash at 30 degrees (no fabric conditioner). Q : What materials are your covers made from? 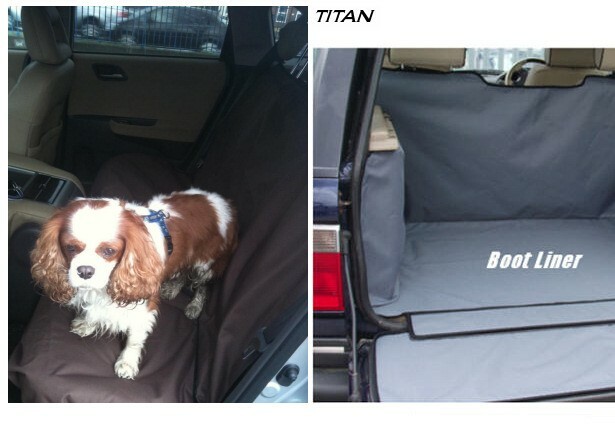 A : Titan Seat Covers and boot liners are made from extra tough waterproof pvc backed woven polyester. This gives excellent wear and protection properties and is easy to maintain. Q : Can I see colour samples? A : If you would like to see material samples before purchasing, simply request the colours you would like using our contact us form. Q : Will my dog slide around on the material? A : Whilst our materials have a woven textured suface rather than a flat shiny surface, we highly recommend our Dog Mat when transporting dogs to ensure they remain safe and comfortable. These mats are tailored to the same shape as the boot liner floor for a great fit and they are machine washable. Q : My car has front seat armrests - will your covers fit? A : We can add holes for armrests, just select the armrest hole option when ordering.